Sasha was a 4-year-old Labrador, she was trained to hunt for explosives. This was to prevent soldiers and civilians losing their lives. Sasha will be awarded the PDSA Dickin Medal. 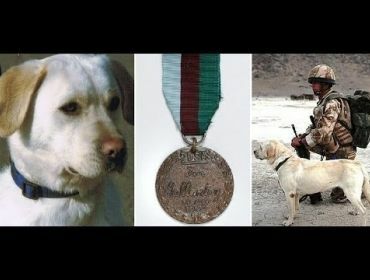 This is an animals’ version of the Victoria Cross and is the highest military award for an animal. Sasha died alongside Lance Corporal Kenneth Rowe. She died in a Taliban attack in 2008. She was deployed with handlers from the Royal Army Veterinary Corps. With her handler she was challenged with carrying out advance patrols, finding safe routes and sniffing out weapons and IEDs (Improvised Explosive Device). In 2008, Sasha was assigned to 24-year-old Lance Corporal Rowe and they were considered the best in the Kandahar region. They died together on the 24th July 2008. Their routine patrol was ambushed by a rocket-propelled grenade attack. Lance Corporal Rowe was from West Moon near Newcastle. He had been due to return home the day before he died but he wanted to stay. This was to complete a planned operation. Sasha had confirmed finds of IEDs and hidden weaponry. 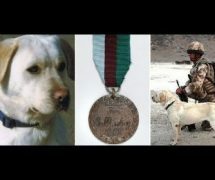 She is the 65th animal to be awarded the medal since 1943.